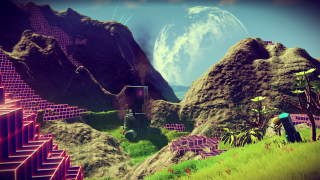 First things first: this is a very PS4-centric No Man's Sky trailer. It shows Shuhei Yoshida playing the game in the company of Hello Games' Sean Murray, and while charming, it's very much a Sony marketing exercise. But! It also shows some new footage of No Man's Sky, which is relevant to us because the procedurally generated space adventure is definitely coming to PC. There's not much new to learn here, except that Shuhei Yoshida likes to shoot innocent sentry-bots. The game is looking as beautiful as ever, and Murray seems more focused than usual on the question of what you actually do in the game. I think that has been answered numerous times already, but in case there was any doubt this trailer demonstrates that, yes, you'll be able to shoot things in space. No Man's Sky releases in June 2016.